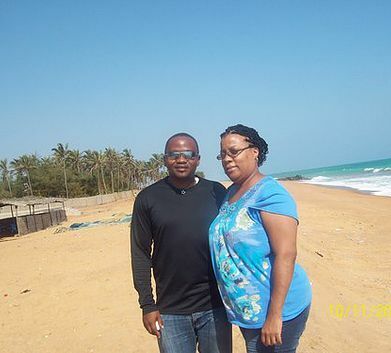 Yvette moved to the West African nation of Togo to teach at a local school. When did you move to Togo and how did you end up living there? I live in Lomé and have been here close to five months. I came here for a teaching job. I decided to leave the States and come to Togo. I wanted to be in a new place where my husband and I would both be "foreigners" and experience something new. How long do you plan to stay in Togo? I plan to live here as long as the job allows. My husband and I are also seeking new opportunities daily. So, if those lead to something promising, we will stay for a few years. Is this the first country that you’ve been to in Africa? No, I have been to South Africa, Kenya, Cameroon, and Nigeria. Was the immigration and visa process difficult? Getting the initial visa was not difficult at all. It was very straightforward. I flew into Ghana and then traveled by road into Lomé. When you reach the Ghanaian border, you will have to secure a transit visa which will be good for seven days. Once in Lomé, my job handled the other parts of the visa process. You married your Cameroonian husband in his home village! What was that like? How have you been welcomed into his family? Yes, we were married in his village in the west province area of Bafang. The experience was wonderful! We had two wedding ceremonies. The first was the traditional one—this was quite a celebration and occurred at night in the home of my husband’s parents. The next day traditional rites performed with kola nut, dimdim, and palm wine. The second ceremony was our registry wedding. This was performed by the mayor and chief of Bafang. I have been completely welcomed into my husband’s family. They have no issue with me being a foreigner. As a matter of fact, after doing some DNA ancestry research, I have ancestry from Cameroon too. How cool is that?! Yvette and her husband Constantin during their traditional wedding in his Cameroonian village, eating dimdim (a small seed). What’s life like in Togo? Life here is very laid back. It has the feel of a large village to me. I enjoy the village life so this is a perfect “second” option. It’s relatively quiet in Lomé—not too much traffic most days, but the streets have the usual morning traffic of any metropolis. What do you love most about living in Togo? What I love most about living here is the weather, the beaches, and the easy-going lifestyle. There is not much to do in the way of attractions. But there are events that take place. For instance, when I first arrived we visited the house of slaves in Agbodrafo. We’ve been to the annual trade fair and also attended the 40th tribute to Bella Bellow. Easiest things to adjust to? The food and climate were easy for me to adjust to. I enjoy hot weather and also love eating African food. Most difficult things to adjust to? Initially, the most difficult thing to adjust to was the language. Although people here speak French and English, sometimes when you want a taxi or to buy items in the market, using Ewe (the local language) would get a better response and perhaps price. What is your social life like in Togo? I am somewhat introverted, so I do not go out to nightclubs and such often and have not since I have been here. But the beach is something we enjoy on a Sunday afternoon. There are private and public ones. We also visit friends and go to religious services to meet our social needs. Can you share a few details on the cost of living in Togo? The cost of living is considerably inexpensive. A two-bedroom apartment is about $250 USD per month depending on the neighborhood. Food is very inexpensive if you shop in the street markets. Going to the indoor supermarkets is about triple of what it costs otherwise. Restaurants or cafe-restos sell hearty meals for under $8. Eating at the upscale restaurants where most expats hang out can set you back $15 to $25 per person. Yes, I have always dreamed of living abroad...since I was about 11 years old after seeing the movie Roots and telling my parents I was going to live in Africa. I wish I would have kept up my French over the years. I would be fluent by now and that would help me navigate around the city a lot more. 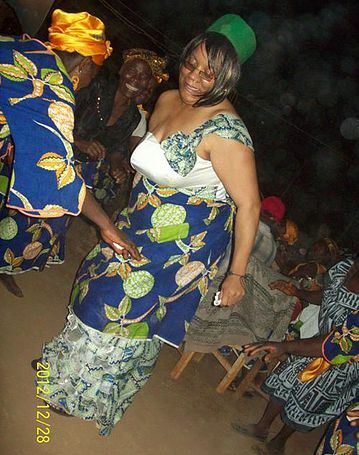 Yvette dancing at her wedding celebration in Cameroon! HOW WERE YOU RECEIVED AS AN AFRICAN AMERICAN? As an African American, I am still seen as a foreigner and not necessarily as a brother or sister. My friends here acknowledge the kinship because they know about the slave trade. However, I still come from a different culture than theirs. I have been told that our accent is not audible. So I find myself speaking slower and also projecting more in my speech. Best advice for someone who wants to move to Africa? My advice would be to visit first. Also, have a list of negotiables and non-negotiables (like a wish list of things that would be acceptable or unacceptable) to prevent disappointment or frustration. For example, some may prefer a bustling night life and that is non-negotiable. Some may prefer lots of Western comforts and can not forego certain amenities. I am very simple in my needs, so not having some comforts from the States hasn’t been missed. But I do miss soul food. Also, it is a good idea to learn some basic language and customs by meeting natives in your original home area before traveling if possible. The internet is not always accurate. And, even with basic information nothing beats having some first-hand knowledge from a native of whatever country you want to visit. Moreover, have enough money set aside in case you want to move back home or relocate to another country. And by all means, have a plan of action that consists of a business venture to start because finding jobs in most African countries is difficult, but not impossible. Teaching English is a good way to earn income in lots of countries. Do you think enough African Americans visit Africa? Why is it an important trip? Africa is the birthplace of humanity. I don’t think enough African Americans visit Africa. I would encourage more African Americans to visit. Some of us consider it home, some do not and have no connection whatsoever. With DNA technology we are discovering some ancestral lines that bring us back, so I am confident that more of us will visit. Africa’s rich and diverse cultures alone are worth a visit. And, if nothing else, visiting may demystify some of the stereotypes or solidify them. I would say come see Africa for yourself. Everyone’s experience is different. Come and have your own story to tell. Yes, I have started a blog. You can find some of my experiences at www.rootzandwingz.wordpress.com. ENJOYED READING ABOUT LIFE IN TOGO? YOU'LL FIND EVEN MORE WEST AFRICAN REFLECTIONS HERE.